Romesco sauce is a brilliant flavour hit, a bright red, bright tasting sauce from the Catalonia region of Spain. 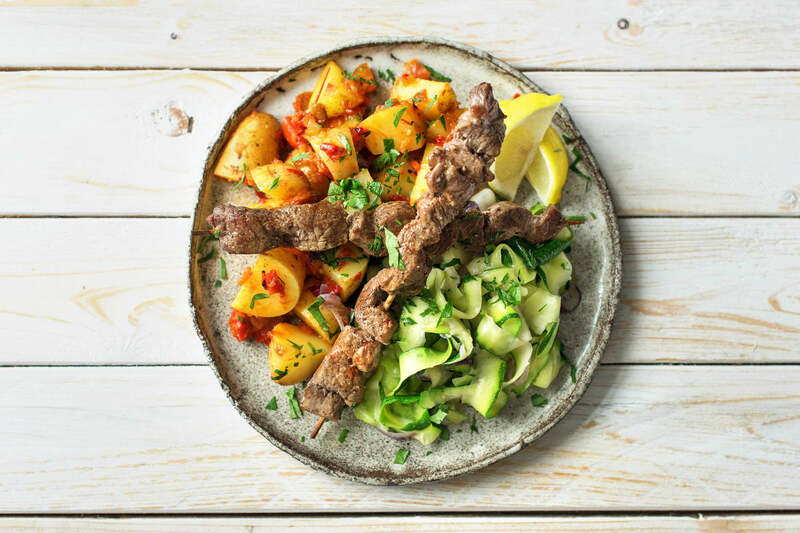 It’s perfect for livening up potatoes and served along with a fresh salad and tasty beef skewers, this dish will leave you ready to dance the flamenco! Preheat the grill to medium-high. 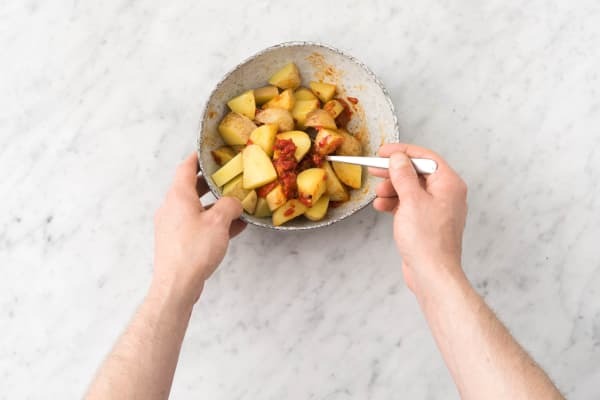 To prepare the ingredients, slice the potatoes into 3 cm chunks (unpeeled). Pick the parsley leaves and roughly chop. 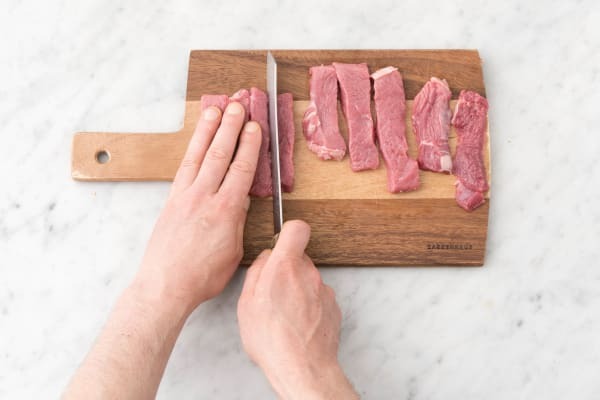 Slice the minute steaks into 2 cm wide strips. Peel and crush the garlic, and peel the zucchini into ribbons. Finely slice the red onion and slice the lemon into wedges. Place the potato in a large saucepan of salted water. Bring the water to the boil and cook for 10 minutes, or until soft when pierced with a fork. Drain. Stir through the chargrilled capsicum sauce, half the olive oil and half the parsley, and season with salt and pepper. Set aside. Meanwhile, in a medium bowl coat the premium beef minute steaks in the smoked paprika, garlic, salt and pepper, and the remaining olive oil. 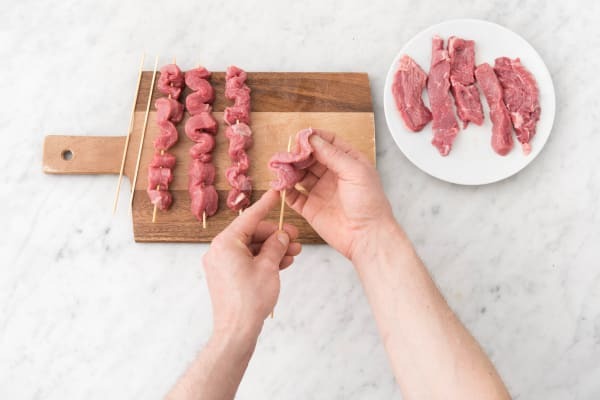 Weave the beef strips onto the metal or wooden skewers alternating up and down so that the meat is evenly distributed along the skewer. Place the skewers in a single layer on a lined oven tray. Cook the skewers for 3 minutes, or until cooked through. Tip: If using wooden skewers, wrap the ends of the skewers with foil to ensure they don’t burn. If you don’t have skewers, lay the beef flat on the oven tray. It will work just as well. Meanwhile, heat a dash of olive oil in a large frying pan over a medium-high heat. 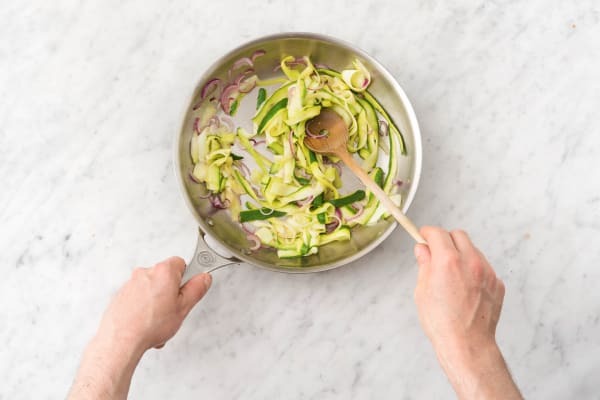 Cook the zucchini ribbons and red onion for 4-5 minutes, or until softened and cooked through. Season to taste with salt and pepper. To serve, divide the romesco potatoes and sautéed vegetables between plates. Top with the beef skewers. Serve with lemon wedges and the remaining parsley. Enjoy!